Be the first one to read about the latest updates, news and announcements regarding REFINE ICD. Please stay tuned for the next REFINE ICD Newsletter. 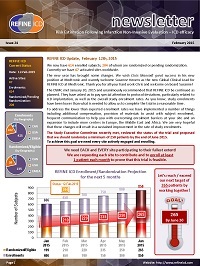 Follow the links to download pdf copies of our past REFINE ICD newsletters. Please be advised that you will be asked to login with your username and password to access the files. © 2016 CON-ECT Cardiovascular Opportunities Network - Epidemiology and Clinical Trials. All Rights Reserved.